Hot Dish! : Din Tai Fun! I am a lover of a bargain even in food. There are few moments of discovery forever etched in my mind. A tiny convenience mart in Texas on my first ever cross country jaunt. "The bags of chips are how much? How many gallons of sweet tea can I have for a dollar?" The gathering of ice cream wrappers, Sun Drop bottles and a heady rush of sugar. Today I have a NEW food obsession courtesy of the Din Tai Fung dumpling house. These sesame noodles are amazing. Satisfyingly rich sauce topping perfectly cooked noodles, delish! 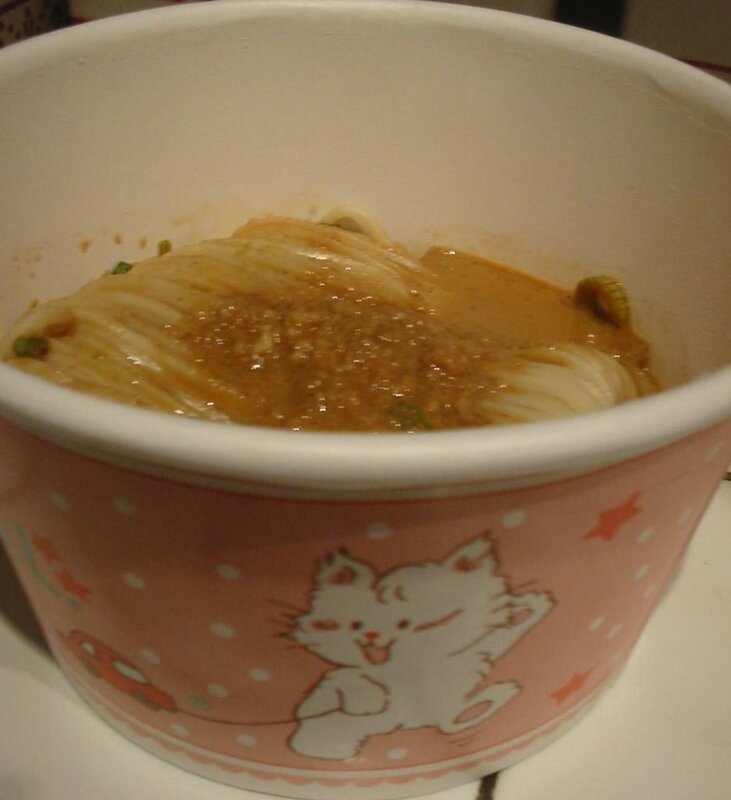 And if THAT isn't enough to turn a girls head the noodles arrive in adorable pink packaging (with kittens on it!!) at an incredible cost of $4.50! Now that IS fun! I thought I might share my yummy Macaroon recipe that I heard you tried yesterday... It's so easy with such amazing results! 1. Set the oven at 350 degrees. Line 2 cookie sheets with waxed paper. 2. In an electric mixer, beat the egg whites, salt, and cream of tartar until soft peaks form. 3. Add the vanilla and sugar. Continue beating until stiff. 4. Remove the bowl from the mixer stand. With a large rubber spatula, fold in the coconut. 5. With a soup spoon, drop the macaroons in 1 1/2-inch balls, about 1 inch apart. 6. Bake the cookies for 25 minutes. Cool on the sheets. - As an added step - I like to drizzle the cookies with melted choclate. Oooh thank you anonymous! I was definitely amazed to see my cookie hating hubby chowing down on these toothsome treats. My pro cookie agenda has been clear for quite some time, I am happy that we can all be united by gooey coconut. what a bonus! noodles & macaroons! may i just say this site continues to give me a reason to live! thank you!